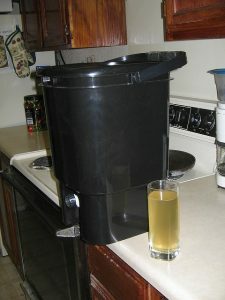 “Composting” Indoors? You Don’t Need Worms Anymore! 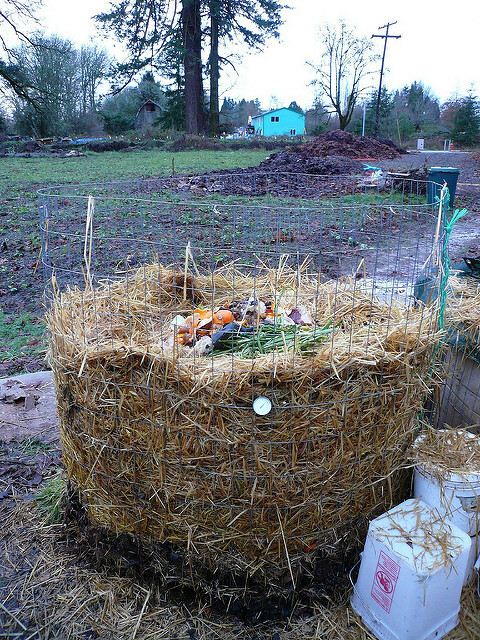 Do you have limited garden space, bear problems, or other reasons that make outdoor composting problematic? If you want to avoid throwing away food scraps, indoor “composting” is not limited to worm bins (vermicomposting) or expensive electric composting appliances. Is an anaerobic (“in the absence of air”) process that you can complete indoors. Requires the addition of microbes. Requires minimal attention (draining of accumulated liquid). Takes only about two weeks to complete once the container is filled. Results in a fermented product that you bury in the garden rather than a finished compost. 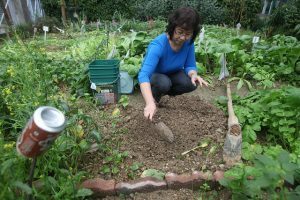 Although the process has a long history, Japanese horticulture professor Teruo Higa developed several microbial products marketed as “Effective Microorganisms” (EM) that have made Bokashi more widely known and more readily available in North America. If you purchase a container and microbe-treated bran, you need only start adding your kitchen waste—including meat and dairy products—to the container in batches, sprinkling with bran, and compressing the material each time you make an addition, then seal the container. Purchased containers include a spigot for draining off leachate every few days. You may see a white mold forming in the container when you add scraps, but this is normal. You just continue adding more scraps, sprinkling on your microbe-containing bran, and compressing the material. You may want more than one container if you want to continuously dispose of scraps, although you can freeze accumulating kitchen waste while your full container completes fermenting. You can construct your own container and prepare your own bran products to save money, but this will require more effort and time. 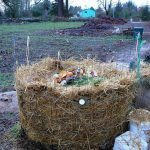 Although the process is beyond the scope of this blog, Bokashi Composting: Scraps to Soil in Weeks by Adam Footer, published by New Society Publishers in 2013, provides information on producing your own bran. Once the sealed container is full, you need to leave it for no more than 2 weeks to finish fermenting. You will then have a product that looks much like what you put into the container—but with a sour pickled smell. 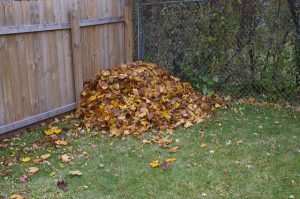 This product will break down very quickly in the garden, but needs to be buried under several inches of soil to avoid attracting animals. If you want a relatively compact, low-maintenance way to dispose of kitchen scraps, Bokashi is the way to go! Disposing of dairy and meat scraps for use in the garden is a real advantage. 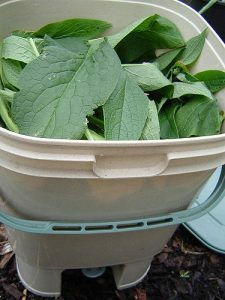 The bucket is odor-free except when you are making additions, and the smell of fermentation when you open the container or drain off leached liquids is not overpowering or unpleasant. You can leave the container unattended for short vacations. You can store completed materials until burial outdoors. The up-front expense of containers and treated bran may be prohibitive, although certainly competitive with indoor composting set-ups (vermicomposting or electric appliances). 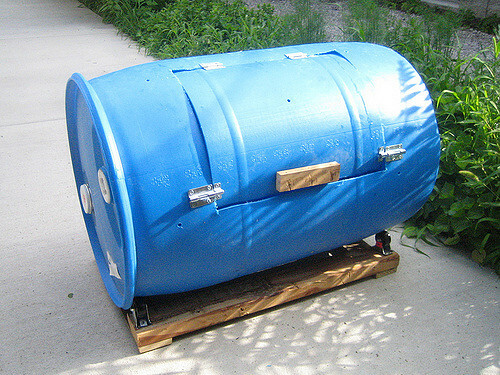 You need new or “fallow” space in your garden for burying the fermented waste. You must dig a hole to use the finished product. You will need to wash out the container for re-use. 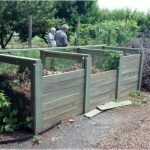 Bury composted kitchen waste in the garden and improve the soil. Research is ongoing about the value of Bokashi products in the garden. The leachate is sometimes touted as fertilizer. It is likely to contain phosphorus and potassium, but not nitrogen! 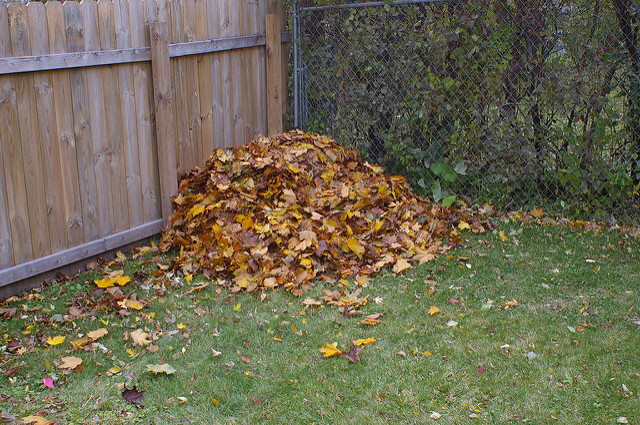 You can simply discard this if you don’t want to try it on your plants. 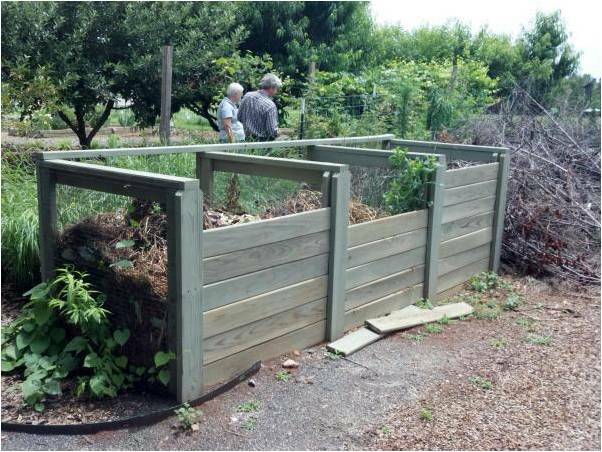 Research on the use of EM to produce compost suggests that in addition to speeding up the process, it can increase nutrients. 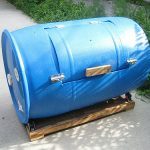 If conventional composting is not an option and you have space to bury your completed Bokashi fermentation, consider this method as an alternative to throwing away your kitchen scraps or waiting on buried scraps to decompose. There’s still time to get your soil samples to the N.C. Department of Agriculture and Consumer Services before Thanksgiving and take advantage of free testing. Samples received after November 23, 2017 through March 31, 2018—the peak soil testing season—are charged an analysis fee of $4 per sample. Soil test boxes, sample information forms, and instructions are available at the Buncombe County Cooperative Extension office, 49 Mount Carmel Road, Asheville. The instruction sheet, A Guide to Soil Sampling—A Soil Test Is Only as Good as the Soil Sample Taken!, explains how to take your sample. Using a clean, stainless steel or chrome-plated trowel, dig about 6 inches deep in 4 or 5 spots in the testing area. Place the soil samples in a clean plastic bucket or bowl and mix well. If the soil is wet, wait for it to dry out before mixing. Fill the soil test box to the fill line and label the box. Take several soil samples from different areas of your yard and use a separate box for each sample. Suggested sample areas include: lawn, vegetable garden, flowerbeds, landscape trees and shrubs, roses, azaleas, rhododendrons, blueberries, and other fruits and berries. Complete an information form for each soil sample, note any lime applications you’ve made in the last 12 months, and indicate the Lawn and Garden Planting Code for the area sampled. You’ll also need to provide an email address for your results. 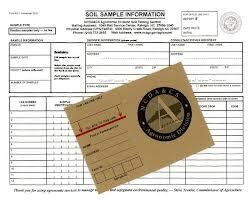 Place the information form on top of your soil test boxes in a cardboard box and mail to the address listed on the form. It is helpful to keep a record to remind yourself of where you took each sample. After the lab has tested the soil samples, you will receive a test report with recommendations for fertilizer and pH amendment. During the winter it takes about two months to receive your test results.